Water bottle irrigation systems have several benefits. What would you do when you finish drinking water from the mineral water bottle? Crush it and throw out? Or Put it in the dust bin near to you? Then wait! Think before you throw it. Nowadays, people are finding innovative ways to utilize waste items especially in the farming field. By using water bottles to irrigate, you will be recycling them and saving them from ending up in a landfill. Water bottle irrigation systems will help keep your plants hydrated throughout the day. You will save yourself a lot of money by building a water bottle irrigation system, rather than purchasing a system and having it installed. The water bottles are buried next to the plants, allowing water to get directly to the root system for better hydration. 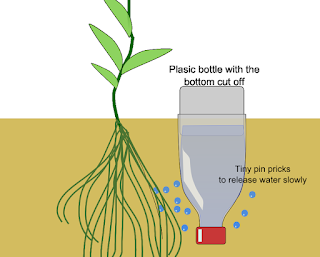 You can also water your trees with a water bottle irrigation system. Your drip irrigation with mineral water bottle is ready. Keep the bottle close to a side of the pot. This is to keep a distance from the plant. Water will slowly flow into the soil in the pot and plant will absorb it as and when required. Water does not overflow from the pot by doing this. Useless plastic becomes useful sometimes. 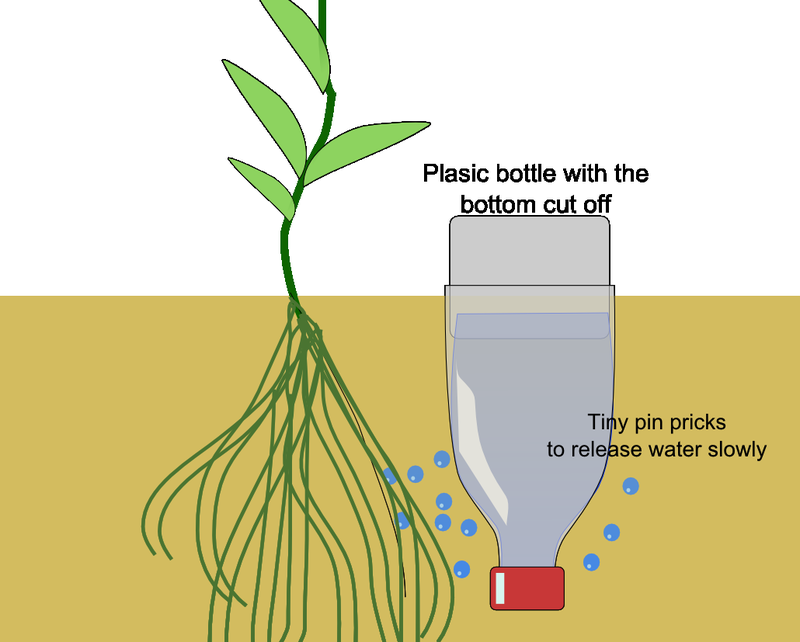 3 Responses to "Drip Irrigation Bottles"